Welcome to CANADIAN PRIDE LOG AND TIMBER PRODUCTS produced by Sperlich Log Construction Inc in the beautiful Okanagan Valley in British Columbia, Canada. You can find our Log & Timber products in Canada, United States, Germany, Japan, Austria, Italy, Russia and the Netherlands. We have been handcrafting log houses and log and timber structures for over 25 years. 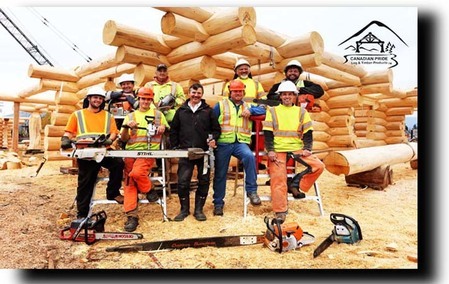 Our production team is experienced in helping clients realize their dream - whether it be a traditional style log house, or a commercial log structure . Our Production has recently returned to our original production location of 5 acres in Enderby BC. We continue to offer the highest quality log and heavy timber products. Check out our different styles, plans, and video of our construction process.